Bottled and waiting for labels. I had to get around to making this booze at some time I guess. Since deck parties will soon be in full swing, there's no time like the present. 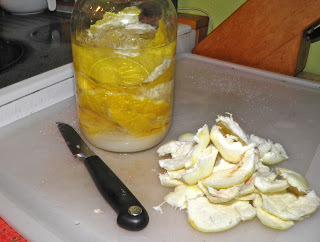 Only some sugar, the lemon zest and flesh goes in the jar. The white pith needs to be removed. It is very bitter. It's the infamous lemon gin, friend to all teenage boys looking for some Friday night fun with their girlfriends (if you know what I mean). It's no more alcoholic than any other similar booze. It may be due to the fact that it's extremely drinkable so very easy for someone to get tipsy quickly. The lemon kind of makes it taste like really good lemonade. Well, regardless of any urban legends this liqueur should be in your arsenal – Friday nights or not. This liqueur will add strong lemon flavour to any fancy backyard drink. You can even branch out and try some concoctions of your own. If you don’t like your friends you could even substitute it one-to-one in any cocktail that calls for lemon juice. I did find a recipe for one intriguing drink that I'll be trying this summer. It's called a Basil Gin Smash. Apparently it was all the rage in Germany in the summer of 2008. It really sounds like it would be delicious. Essentially it's a variation on a whiskey smash – lemons, mint and bourbon whisky. The differences are this uses gin, lemon and basil. Sounds intriguing, right? 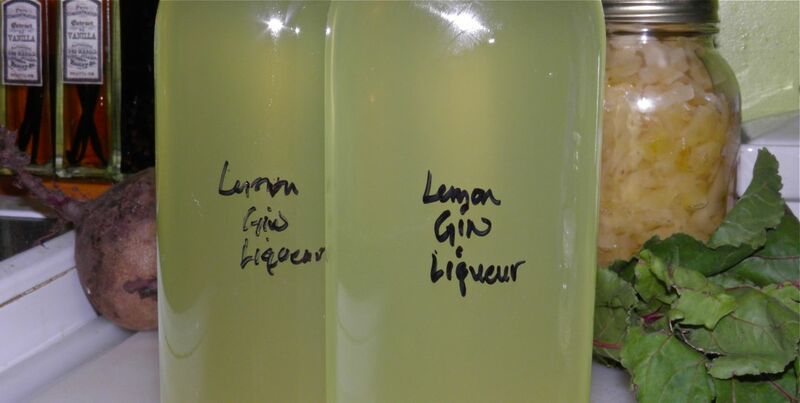 Here is a variation on the recipe, using my lemon gin liqueur instead of the lemon juice. Add the remaining regular gin and a little ice and shake well. Strain into an Old Fashioned glass filled with ice. 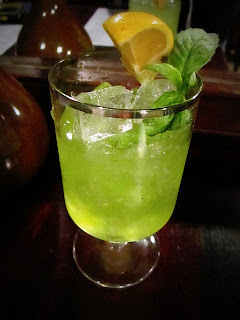 Top with soda, garnish with a sprig of basil and enjoy! 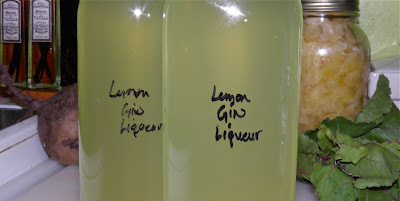 The following recipe, as the title states, is for lemon gin liqueur. 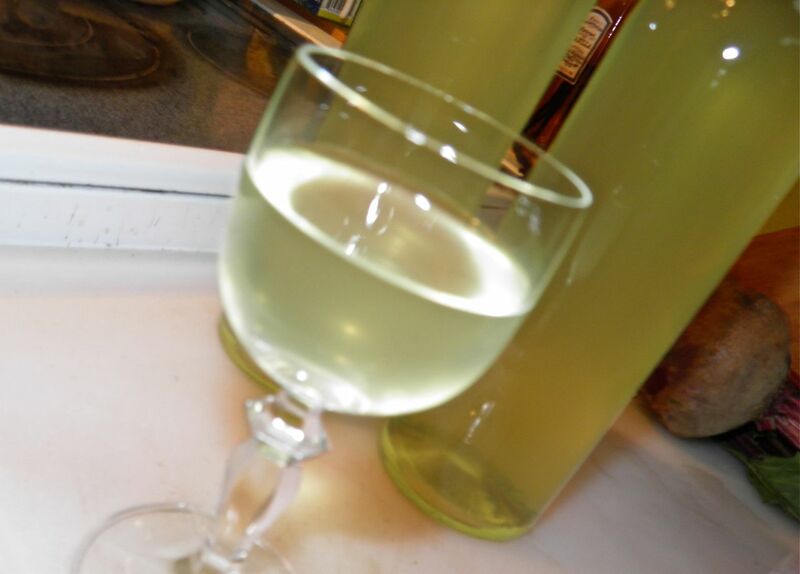 If you want to make just lemon gin leave out the last step of making the sugar syrup. Combine all in Mason jar and let sit for 2 weeks. Shake well every day for the first week to dissolve the sugar. At the end of the infusing period, strain through fine cotton cloth. Combine the cup of sugar and water and bring to a boil. Simmer for 5 minutes and then let cool. Combine the gin with the syrup, stir well and bottle. Very pale yellow, but very lemony, and probably quite dangerous.